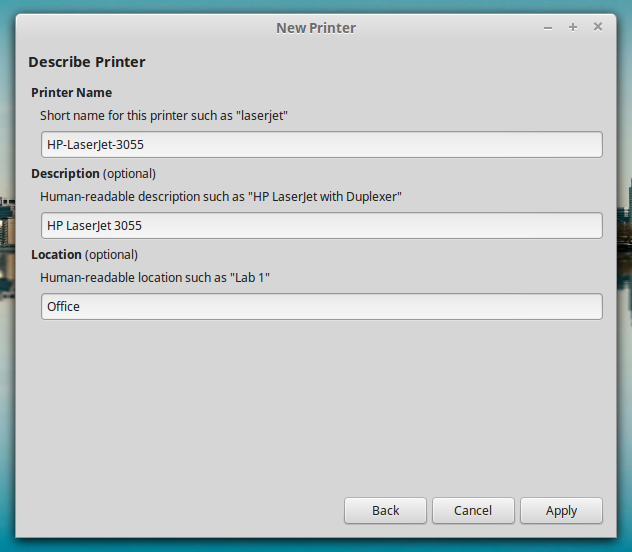 As I have a laptop which is running LinuxMint 17.2, this post is written to show you how to add HP LaserJet 3055 on LinuxMint 17.2 Rafaela. Our office owns an HP LaserJet 3055 printer to print word, spreadsheet, presentation documents and other documents. It is basically a good printer for office. The printer is a network printer and is assigned with a static IP address. You have to be in the same subnet to be able to add the printer. I don’t want to talk more about the printer on this post. As I have a laptop which is running LinuxMint 17.2, this post is written to show you how to add HP LaserJet 3055 on LinuxMint 17.2 Rafaela. 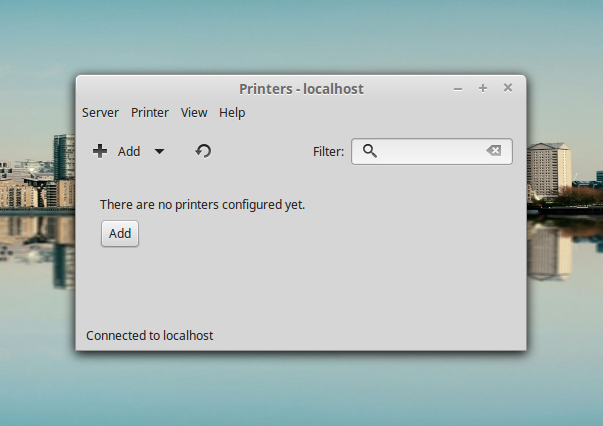 Magically, it is very easy to add this printer on LinuxMint Rafaela as the printer driver is already installed by default. You don’t need to download it manually. 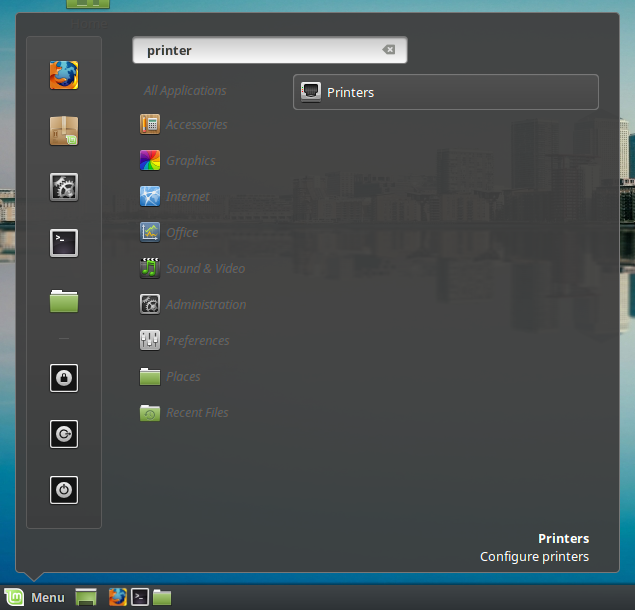 Click LinuxMint Menu located in the bottom left taskbar, then type ‘printer’ in the search field to quickly find Printers settings. Click the Printers menu to start configures a printer. Click Add to start adding a new printer. Magically LinuxMint 17.2 will automatically detect the printer under Network Printer section. Select the printer and then click Forward to continue. 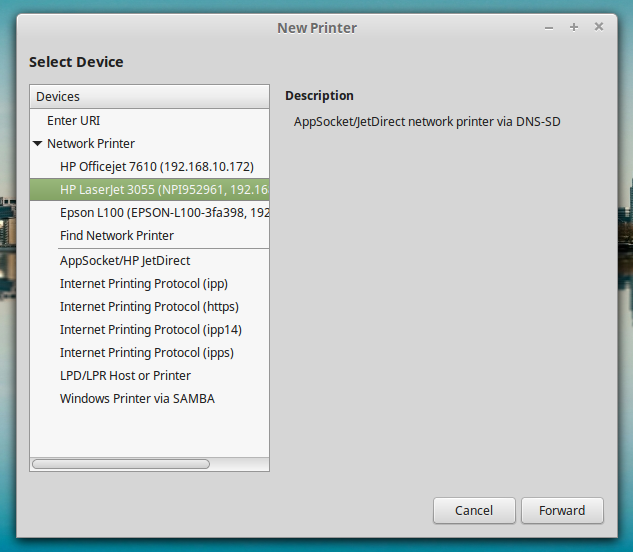 LinuxMint will configure the printer. Once finished you need to give it a name. Just accept the default name is OK. Finish it by click Apply button. You will be asked to test the printer. You can safely ignore it or accept it to print test page. If everything configured correctly, you should be able to print a test page.